An add in the NYFA ( New York Foundation for the Arts) implies that Baby-sitting is now an opportunity for artists. Following the statement and the listing above, baby-sitting is an opportunity in the art now. Thank you for your feedback and for using NYFA Classifieds. Regarding this specific listing, many artists have expressed interest in these types of part-time positions to supplement the income from their arts practice. They don’t necessarily want to work full-time and prefer a job that lets them focus more on their art work. Also, often these types of jobs are posted by artists themselves (in this case the advertiser is a documentary filmmaker), who see our classifieds as a valuable resource for hiring good employees. Wishing you the best of luck in your search. The fact that the person who put the add is an artist, doesn´t make this add into a job in the arts. Also, looking at the statement at the NYFA, (https://www.nyfa.org/Content/Show/Online%20Resources) “NYFA Classifieds is one of the best known listing services for opportunities in the art“. 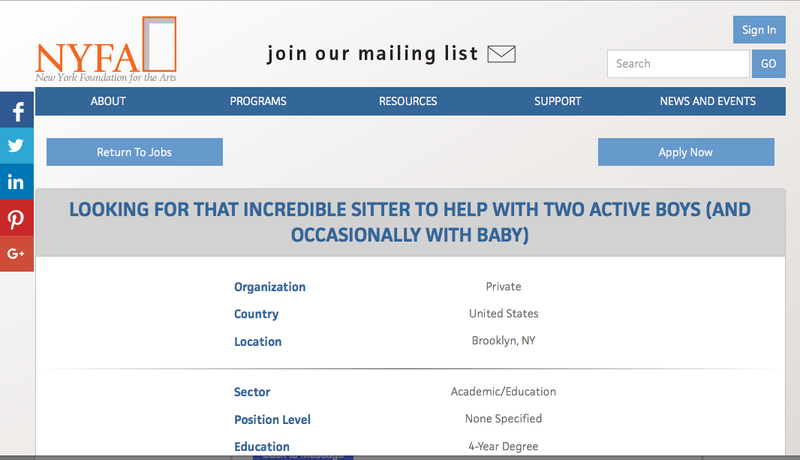 But this listing “Looking for that incredible sitter to help with two active boys (and occasionally with baby)” is not an opportunity in the arts. In consequence, I found this listing not fitting into the description that the NYFA describe as mission, it is not coherent with the mission. I also have to tell you that your argument that artists don´t want to work full time is a myth. What happen is different, there is not work for artists and they do any other job or gig. In addition, I am very aware of artists need to supplement their income with other jobs that are not in the art and even more I am well aware of precarity of the market place for artists: However to offer <jobs not in the art> in a <site for the arts> it is (in my view) a practice that helps precarity. https://www.nyfa.org/Content/Show/Online%20Resourcesamong artists. Why? the people looking for cheap labour have now a place to go, artist sties. They will know of a pool of individuals, artists, who never paid at their trade, will do things for money and not for a lot of it”. As and artist, and specifically an artist fighting for artists working rights, I believe that either NYFA for the arts change their statement about the mission of the adds or not allow this kind of add in the site. Labor precarity in art is related to the scarcity of work. The low level of demand means accepting what in other circumstances would be unthinkable. In a desperate situation any worker, artists in this case, will resort to desperate measures, even though they know that ultimately it is not beneficial because it goes against the rules of their discipline; they will do anything, even offer their services for free. In these circumstances, the excuses to justify not paying artists for their work range from making them believe that the work is done for their own benefit (as in the case of an exhibition), to suggesting that, since the artist enjoys their work, payment is not necessary. For this reason there is precarity and underemployment among artists, as well as among other cultural workers who ‘enjoy’ working. All this points in the same direction, that art is not considered a job. There are two types of workers, those who are governed by a union and those who are not. There is no system of labor inspection in the art world to specifically record irregularities in recruitment (including lack of contract) or in payment, or to prevent the staging of exhibitions disguised as prizes, false self-employment and competitions based on rules that violate intellectual property rights. To a certain extent, the fact that being an artist is not considered a job is because it only matters to a small part of society and because of the way our perception of art has been shaped. In this respect, education is critical. Art does not feature in the curricula of schools as a mandatory subject. It is true that it is always present in education from the beginning, from nursery, and also that it is used as a form of entertainment or therapy. Children do receive painting classes, but they are not taken as seriously as those of mathematics. An education in the arts requires an ability to read visual objects and to think visually, to be able to translate ideas into forms. And when art does form part of general education, quite often it is only artistic technique that is given importance. This pattern is reproduced later on in professional contexts. At present, technique (in Photoshop or AutoCAD, or any other computer program) is considered more important than the idea. This occurs, for example, in job advertisements, when what is required are experts in Photoshop rather than graphic designers, or in architecture, where buildings do not transcend the computer program with which they have been drawn, and the result: the building resembles a model. Being able to translate an idea into something visible that is true to it without being hampered by the imperfection of the tool, mastering the art, is a skill that very few acquire. The idea that artists should be poor is commonly accepted. Work, lack of payment and abusive practices in the art world today are ongoing issues for discussion. Defining what art is and what makes a person an artist is not as easy as identifying the two things. There are two essential features: “The artist: qualified to earn 120€ an hour earns 6 or nothing, and should feel grateful to have been chosen.”  The goal of many artists is to be ‘chosen’ and to gain access to the network; but some artists are focused on something else, they want to change the way that art works, which is currently humiliating, unregulated and offers no public benefit whatsoever. Faced with this situation, the choice of the artist (who is alert and aware) is to renounce being chosen. The main objective is progress through art (when progress is understood as perfecting, not merely moving forward). To achieve this, competition is likely. But competition should not be the end, but the means. What is the point of wining if one can be the game itself? Artists fight. One seems to win. In reality, art loses out. I forgot one thing, this is from your web site explaining what can you post. It said “All listings should be arts and culture related.” Can you explain how babysitting is culture related?